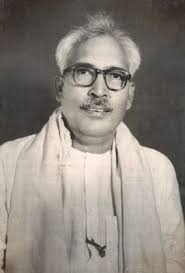 Acharya Hazari Prasad Dwivedi was born 19th of August 1907 in Dube Chhapra village District Ballia Uttar Pradesh. Acharya Hazari Prasad Dwivedi contributions to Indian creative and critical writings are phenomenal and interests diverse. Acharya Hazari Prasad Dwivedi was HINDI NOVELIST literary historian, essayist, critic and scholar. Acharya Dwivedi penned numerous novels, collections of essays, historical research on medieval religious movements of India especially Kabir and Natha Sampradaya, and historical outlines. Besides Hindi, he was master of many languages including Sanskrit, Bengali, Punjabi Gujrati as well as Prakrit Pali and Apabhramsa. Steeped in traditional knowledge of Sanskrit, Pali and Prakrit, and modern Indian languages, Dwivedi was destined to be the great bridge maker between the past and the present. As a student of Sanskrit, steeped in the Sastras, he gave a new evaluation to Sahitya-sastra and he can rightly be considered as a great commentator on the textual tradition of the Indian literature. Acharya Hajari Prashad Dwivedi had his early education until middle examination at village school. After completing his intermediate, he also studied ASTROLOGY and SANSKRIT at a traditional school to qualify for 'ACHARYA' degree in astrology and SHASTRI degree in Sanskrit. Acharya Hajari Prashad Dwivedi was awarded by the PADMA BHUSHAN in 1957 for his contribution to Hindi Literature and in year of 1973 he again got Sahitya Academy Awards for the collection of his essays.